Trent Alexander-Arnold has signed a new contract until 2024, and Reds fans were quick to show their delight via Twitter. Trent himself and manager Jurgen Klopp were just as delighted as the fans, and it shows just how well thought of the full-back is that the reaction has been so good. There might not be any incomings this month, but keeping the top-class players the club already has is a huge boost. Andy Robertson, of course, only signed a new deal earlier in the week. 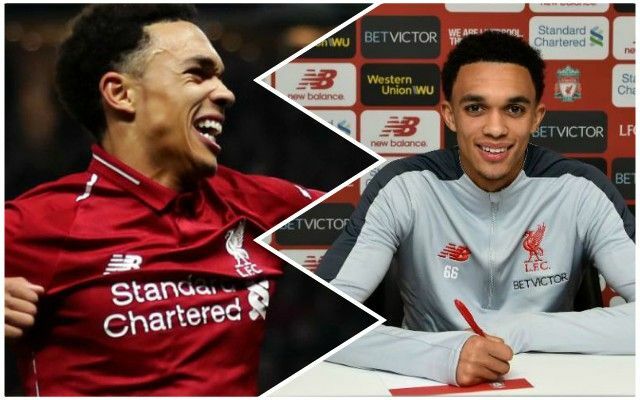 The reaction to the confirmation that Trent had put pen to paper on a new deal was unanimously positive: Reds fans were buzzing with the news, as the following tweets show. Made up Trent is signed up! Some great work going in to securing our players for the long term. Trent is exactly what LFC needs to build for the future. A local boy who only dreams of playing for Liverpool & the likelihood that he wont turn his back on us for glory or money. That lifts the mood around the club even more ahead of the game against Crystal Palace this afternoon. Trent probably won’t be featuring as he recovers from a knee injury, but his new deal means there will be plenty of talk about him on the Anfield terraces regardless.